BOSTON (AP) Hours before the Celtics took the court Thursday night to protect their winning streak against the defending NBA champion Golden State Warriors, Jaylen Brown was walking around in a fog. Boston’s second-year forward was not even thinking about basketball after learning about the sudden death of his childhood best friend, Trevin Steede, on Wednesday night. But after talking to his family and having conversations with Celtics coach Brad Stevens, Brown looked to the basketball court to find solace. The 21-year-old ended up playing one of the best games of his young career. Brown had 22 points and seven rebounds, Kyrie Irving had 11 of his 16 points in the fourth quarter, including two free throws that put Boston ahead in the closing seconds, and the Celtics beat the Warriors 92-88 on Thursday night for their 14th straight victory. ”He inspired me to come out and play and I played in his spirit,” Brown said about Steede. They met after Brown transferred to Joseph Wheeler High School in Marietta, Georgia. Steede noticed Brown sitting alone one day and told him he could sit with him. ”Ever since then we’ve been best friends. … He’s been my brother.” Brown said. He said the circumstances of Steede’s death are still being determined and he declined further comment out of respect for his family. After the final buzzer, Irving walked over and embraced Brown. ”Ky gave me the game ball and said, `This one was for Trevin,”’ Brown said. Kevin Durant had 24 points for Golden State. The Warriors had won seven in a row. Playing his second game since suffering a facial fracture, Irving shed his protective mask in the second quarter. Then, with the game tied at 88, he was fouled on his layup attempt and calmly made a pair of free throws. Durant then came up empty on his jumper on the other end. Golden State led by as many as 17, but had to lean heavily on its reserves as its trio of Stephen Curry, Klay Thompson and Durant struggled offensively. Curry, who returned to action after missing a game with a bruised right thigh, was the most ineffective. He was 3 of 14 from the field – 2 of 9 from the 3-point line – and had nine points. Curry sat for a long stretch after picking up his fourth foul early in the third quarter. 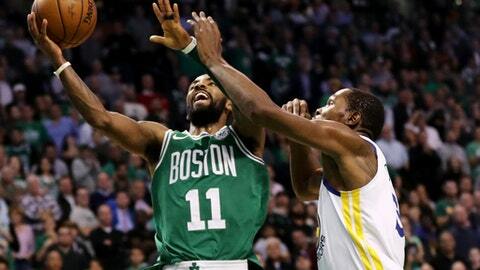 Boston came in limiting opponents to just 94.5 points per game, the stingiest mark in the NBA this season. It did even better against a Warriors team that entered the night averaging an NBA-best 119.6 points. Warriors: Their 88 points was a season-low. Had seven turnovers in third. Celtics: Horford registered a double-double in consecutive games for the second time this season. He failed to record back-to-back double-doubles at any point last season. ”I asked our trainer if he can officially play without that and the response was, `Yes, but it’s not recommended.”’ – Celtics coach Brad Stevens on Irving taking off mask. The Warriors went without a point from Durant’s 20-foot pull-up with 4:49 left in the third quarter until Omri Casspi’s floater with 34.5 left tied it at 68 – a 19-2 Celtics’ run. Curry, Durant and Thompson were just 7 of 26 combined from the field in the first half. But the Warriors were able to maintain their lead thanks to 14 fast-break points. Durant was the only one of the three to score during a 12-0 Warriors run late in the second quarter. Boston trailed by just 47-42 at the half, closing the quarter with a 13-2 spurt. Celtics guard Gordon Hayward, who has been sidelined since suffering a broken ankle on opening night, was on hand for Thursday’s game. He sat behind the Celtics’ bench and received a loud ovation from the Garden crowd when he was shown on the jumbotron. Warriors: Continue their four-game road trip Saturday at Philadelphia. Celtics: Visit Atlanta on Saturday to begin a three-game trip.